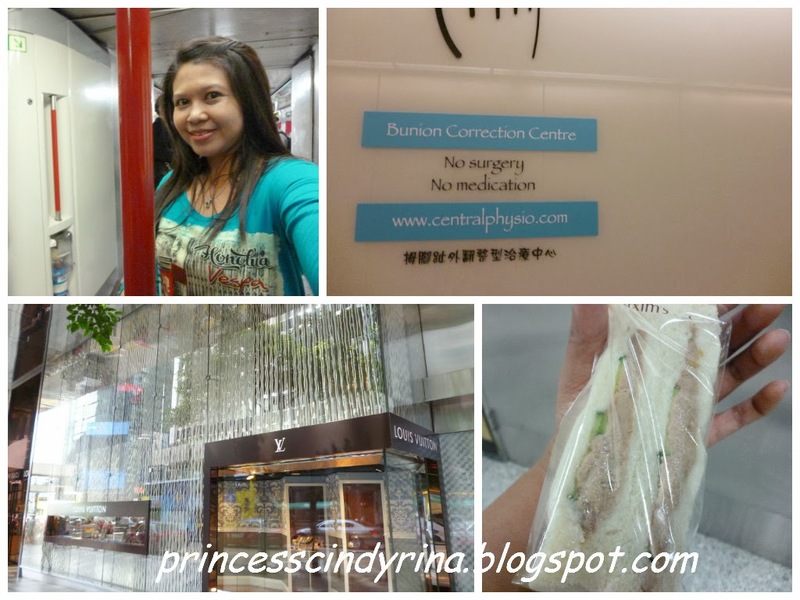 Recently, I was in Hong Kong for 6 nights for my Bunion foot micro current treatment with Dr Milly Ng. Why Hong Kong? Only Dr Milly has the expertise to treat bunion without surgery. She use microcurrent to press on acupoint and wake up all those sleeping nerves from long sleep.The potrute bone on the big toe will take time to move back to place.I need to work harder.But at least now my big toe can straighten a bit. But I can say I gone through hell of pain and until now still working out my feet to the nearest normal people feet. She also taught me how to walk correctly and physio exercise for maintenance. The suggested treatment is 10 times within at least 10 days which I my tight budget squeeze to twice treatment in 5 days. Seriously....the photo of the bruises below just at second day....the thick blue black on my calf really only heal after one week after the treatment. Yes! I still can walk like normal and can run and jump like others after the treatment. During the treatment....I wish I don't have to go through such a painful experience...but I have to. This trip to Hong Kong seriously....the most expensive and more expensive than my previous trip to Seoul! The treatment itself cost me nuklear bomb.... the effect to my paying off this treatment still...feel the effect..WTH!!!! Did I fully recovered....mmmmm not to the perfect but at least I less painful and can sleep at night. This is first day....and the result ...is quite amazing!!!! at least now my toe and feet more flexible... and able to listen to me. What is the pain like during the treatment? The doc said one of her patient said the pain is more painful than the labour pain. Pat to my back....for getting over that torturous moment bravely!!!!! keep practising and wish my feet able to continue listen to me and be in nearest perfect shape!!!! This photo is the latest last Saturday photo. All readers! please note that I don't represent Dr Milly or receive any commission from your sign up with Dr Milly. I am just a lady who save up my hard earn cash for two years to receive this treatment because I don't want to leave my life in pain due to bunion feet. I don't decide for you. I am just telling you my experience. It is all about my own personal preference. To me whatever decision we takes in life is all about gambling. No pain No gain and I don't pray for the perfection. So...stop sending me email on nonsense questions such as ...do I recommend this or should you do this. If you have any questions please email to Dr Milly Ng at Centralphysio.com website in HK. She will reply to you promptly. Thanks so much for sharing your story with everyone! 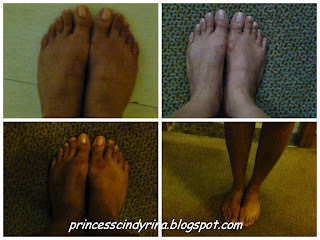 How are your bunions and the pain now, a couple of months later? 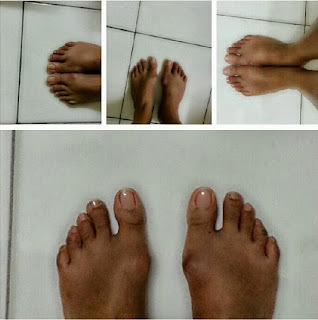 Hi, I have no more bunion pain for me after the micro current treatment. I maintain by doing the exercise every night for 20 minutes before sleep. I will post some latest development soon. Hi there! appreciate if you contact Milly Ng at Central Physio in HK. She knows best what to prescribe to patient. Thank you for your interest. Sorry to hear about the bunion pain you have. Bunions are more common in women. You may like to try Correct Toes, invented by an American podiatrist (foot specialist)... it helps to spread out *all* five toes. It is now available in Malaysia via MBA Chiropractic. Get well soon!